Meeting to deal with estranged couples' libelous claims goes on as planned, participants reveal shocking statistics. The Knesset Special Committee for Distributive Justice and Social Equality on Thursday held a discussion chaired by Likud MK Yoav Kisch about false accusations between couples. The meeting was held despite the opposition of 13 women's organizations, who attempted to force a cancellation. Less people attended than previously expected, and the meeting was kept short. It will be continued on Monday. 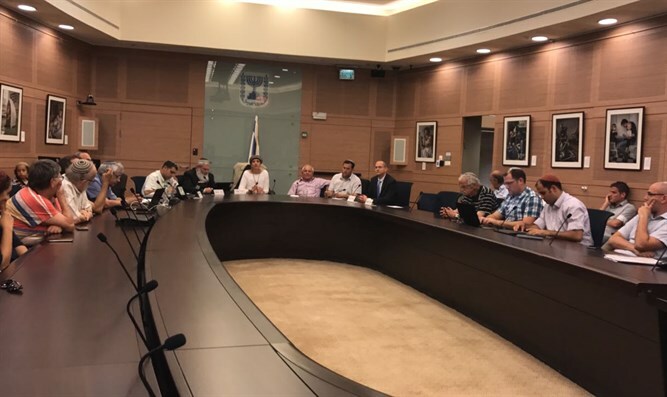 MK Amir Ohana (Likud) also participated in the meeting, but MK Miki Zohar (Likud) could not participate for personal reasons. Ohana said he was a lawyer and had previously worked with the police force. During his time with the police, he saw men "who found themselves arrested and felt like their entire world was destroyed - and in some cases they were right, their entire world was completely destroyed." "And there is no reason for someone who wants to make a libelous claim not to do so. She can do it. Some of the divorce lawyers actually tell women to file a libelous complaint claiming he hit her, or did something else to her, because it will make his situation worse, and it will help their female client get what she wants in court. "It's completely unthinkable that there shouldn't be, if we see that something might be a false accusation, any research done. We're harming all of society, and especially the victims, whose entire world has been turned upside down - and who in most cases are completely innocent." "The Familists" CEO Gil Ronen praised Zohar for his bravery and continuous work in dealing with the issue of false accusations, despite the political risk involved. Ronen quoted an article by Yael Hermel, who previously directed the system for Israeli social workers. In her article, she quoted researchers who said that false accusations in divorce are a "plague" and "witch hunt," and that 14-23% of libels in which one partner claims the other harmed the children are made during divorce proceedings. According to the researchers, Israel's justice system refuses to hold the women who make these claims accountable, even when there is proof that the claim is false. The justice system also forbids Israel Police from interrogating the women who make these false claims. "They let people use force to destroy other people," Ronen said. "Imagine a situation in which a man is married, he has kids, his life is happy, he's a good husband and father. And then someone from his past comes and makes a false claim against him. Suddenly he's in jail, his children suffer, his wife suffers, and the person who made the claim can sit in her chair at home and laugh at their suffering. It harms all of society." Fathers' Rights activist Yair Kanai spoke about the exaggerated use of child contact centers in Israel. According to him, over 20% of children of divorce who go through the legal system are sent to these contact centers to see one of their parents - usually the father - and are forbidden to meet him outside the difficult and depressing center. Kanai also said that outside of Israel, only 2% of families use these contact centers, and it is therefore obvious that thousands of Israeli parents and children suffer needlessly. "The suffering these people go through for things they are innocent of must stop," Kisch concluded. "I am happy that the Committee finally took responsibility and is dealing with the matter."